High-profile academics and future water industry leaders from nine African nations have taken part in the first two ICE WaRM Professional Development Programmes for the region’s representatives. The first delegation, which came to Australia in July and August, was made up of 15 academic and industry leaders from six sub-Saharan nations which are members of the Southern Africa Development Community (SADC). The group included five representatives from Malawi, four from Zambia, two from Kenya, two from Rwanda and one each from Botswana and Zimbabwe. The delegates ranged from mid-career professionals to well-respected leaders in the sector. The eight men and seven women studied in Adelaide, Sydney and the Gold Coast, taking part in a series of intensive short courses, examining water management issues in Australia and their application in Africa, as well as spending a week of field work in South Australia focusing on groundwater, wetland and forestry projects. AusAID supported this activity through the Australian Leadership Awards Fellowships programme. The SADC was formed in 1992 and represents 15 nations with a population of 257.7 million people. It aims to promote sustainable and equitable economic growth and socio-economic development through efficient productive systems, deeper co-operation and integration, good governance and durable peace and security. All the major water courses in the SADC countries cross national boundaries and the organisation’s Water Directorate has been fostering cooperation to share the region’s water resources. From small beginnings, this work has been incubating formal sharing arrangements and new institutions to manage these trans-boundary river basins. In October, a second African group from the Limpopo Watercourse Commission (LIMCOM) took part in another customised ICE WaRM programme. LIMCOM is one of the new institutions emerging from within the SADC and is supported by the governments of Germany, the UK and Australia through the German agency GIZ. The LIMCOM group was made up of two representatives from each of the riverside member countries of Botswana, South Africa, Zimbabwe and Mozambique, the Interim Executive Secretary of LIMCOM, plus two GIZ officials providing the long-term technical support. The group started in Canberra, where they held meetings with national agencies including the Murray-Darling Basin Authority, before a visit to the Hume Dam and a journey along the Murray River to Shepparton in Victoria. It ended with the group attending and contributing to the International River Symposium in Melbourne. Financial support for the visit was provided by GIZ. 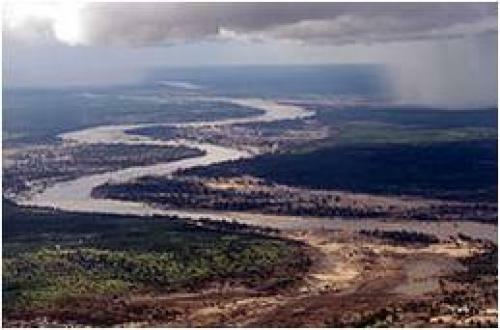 The 1750-kilometre Limpopo River rises in central southern Africa and flows eastwards to the Indian Ocean. The Limpopo has a catchment area of around 408,000 sq km. LIMCOM was formally established in 2003 and is now starting the first stages of its practical operations. These Professional Development Programmes follow on from the earlier visit by Krasposy Kujinga, from the Institute of Environmental Studies at the University of Zimbabwe. Under ICE WaRM’s International Visits and Exchanges Programme (through the WaRM Trust), he examined a variety of water management techniques in South Australia, before travelling to Canberra to make presentations and work with colleagues in the Crawford School at the Australian National University. Mr Kujinga is now conducting research with the Okavango Research Institute in Botswana and has been instrumental in several regional initiatives.